Bettye Jean (Allen) Mason was born on February 9, 1933 to Charles and Ruby (Roberts) Allen in Hugo, OK. She attended school and on May 25, 1953 was united in marriage to Clarence Edward Mason in Amarillo, TX. After his honorable discharge from the service in December of 1955, they moved to Platte, SD to raise their family and begin farming. Bettye took pride in being a homemaker, wife, mother and grandmother. She was a member of the Olive Presbyterian Church and the TOPS Club. She enjoyed playing golf, cooking, gardening and sewing. Grateful for having shared in Bettye’s life: three children: Pamela Mason of Dallas, TX, Patricia (Lonnie) Tutsch of New Underwood, SD and David Mason of Platte, SD; two granddaughters: Courtney (Lyndon) DeVries of Platte, SD and Erin (Lynn) Walstad of Platte, SD; five great grandchildren: Kallie, Addison, Will and Bria Walstad, and Creighton DeVries; three brothers: Ricky Allen, Geary Allen and Michael Allen all of Texas; three sisters: Kathy Winkler of Colorado, Melba Nethery and Sue Bowland both of Texas; along with many nieces and nephews. Bettye was preceded in death by her husband, Clarence Mason (Oct. 10, 2015); two sons: Randal Mason (Apr. 21, 2012) and James Mason (Nov. 18, 1976); her parents, Charles and Ruby Allen; and three brothers: Charlie, Harold and Larry Allen. Clarence Edward Mason was born May 1, 1930 to Orrin and Myrtle (Parish) Mason in Platte, SD. He graduated from Platte High School in 1948 and went on to serve his country in the US Air Force in December of 1951. On May 25, 1953 Clarence was united in marriage to Bettye Allen in Amarillo, TX. After his honorable discharge from the service in December of 1955, they returned to Platte to raise their family and begin a career in farming. In 1995 he was awarded Seed Stock Producer of the Year and was named the Charolais Family of the Year for 2015. Active in the Platte community, Clarence was a member of Campbell-Timmerman American Legion Post #115 and Olive Presbyterian Church, where he was an Elder; as well as being a 60 year member of Doric Masonic Lodge #93. He also served on the Boards of the Lake Platte Golf Club and Platte Health Center. Clarence enjoyed golfing, playing cards, traveling and attending Platte-Geddes Black Panther sporting events. Clarence E. Mason, 85 of Platte, SD passed away Saturday, October 10, 2015 at Plattee Care Center Avera. Grateful for having shared in Clarence's life: his wife of over 62 years, Bettye Mason of Platte, SD; three children: Pamela Mason of Dallas, TX, Patricia (Lonnie) Tutsch of New Underwood, SD and David Mason of Platte, SD; two granddaughters: Courtney (Lyndon) Devries of Platte, SD and Erin (Lynn) Walstad of Platte, SD; four great grandchildren: Kallie, Addison, Will and Bria Walstad; three brothers: Don Mason of Platte, SD, Ken Mason of Platte, SD and Lester Mason of Clinton, MO; two sisters: Alice Fischer of Ft. Collins, CO and Georgia Adolph of Flandreau, SD; along with many nieces, nephews and friends. Clarence was preceded in death by: two sons: Randal Mason and James Mason; his parents, Orrin and Myrtle Mason; a brother, Vernon Mason; and a sister, Irene Lien. Randal Edward Mason was on born on September 19, 1955, the oldest son of a family of five to Clarence and Bettye (Allen) Mason in Amarillo, TX. He attended school all 12 grades in Platte. 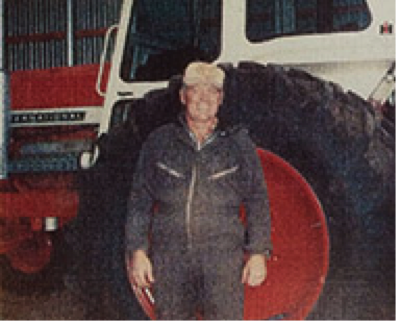 He worked on the family farm, Prairie Valley Farms, his entire life until his death. Randy enjoyed spending time with his family, especially his two nieces, Courtney and Erin, his two great-nieces, Kallie and Addison and great-nephew, Will. His best friend was his dog, Noel. He enjoyed his friends at Pranger’s Feed Mill, Kuip’s Lounge and Platte Lanes. Randal was able to pass along the gift of life through donation. Randal Mason, 56, of Platte, SD passed away Saturday, April 21, 2012 of a heart attack on the family farm. Grateful for having shared in Randy’s life: his parents, Clarence and Bettye Mason of Platte, SD; a sister, Patricia (Lonnie) Tutsch of Rapid City, SD; a brother, David Mason of Platte, SD; a sister, Pamela Mason of Dallas, TX; nieces: Courtney Brumbaugh and Erin (Lynn) Walstad, Kallie, Addison and Will all of Sioux Falls, SD.Randy was preceded in death by: a brother, James Mason; grandparents: Orin and Myrtle Mason and Charles and Ruby Allen; uncles: Vernon Mason and James Fischer; uncle and aunt, Norman and Irene Lien; along with cousins: Jean, Karla and Todd Mason.